Inducted 1992. Undefeated State Champions. 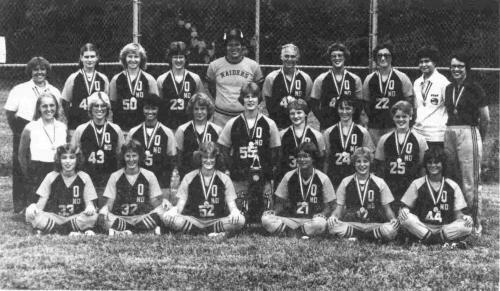 The 1981 Lady Raiders softball team was an undefeated state champion at 29-0. The Raiders came from behind to capture all three victories in the state tournament at Pekin in what was a single class tournament at that time. The Raiders scored two in the sixth inning to down Cahokia 3-2. The next day it became Washington’s turn as the Raiders scored four in the sixth and two in the seventh for a 7-3 win and finally in the championship game against Herrin, the Raiders scored two runs in the bottom of the seventh to win with a score of 2-1. Four Raiders were chosen to the 1981 All-State Tourney Team. Amy Miller was MVP, Lori Damhorst at 1st base, Caren Kemner at shortstop, and Connie Trine in right field. Several of these Raider players were on the undefeated 1980 Volleyball Team that captured the State Championship in the fall.